With KitchenGarden, fresh herbs can be cultivated all year round. 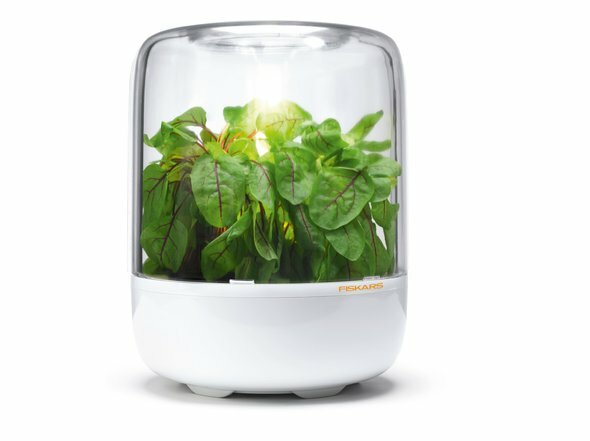 An integrated LED light ensures that herbs not only retain their freshness but also thrive under easy growing conditions. The container comes in two versions: the basic version includes an LED light with white light. The premium version features a remote control and has an LED core with six LED lights offering a wider colour spectrum. Statement by the jury: "The mini-greenhouse KitchenGarden harmoniously blends in with kitchen interiors thanks to its formally and functionally accomplished design."